View More In Dutch Ovens - Page 5. This is Lava’s Signature Round Mini Dutch Oven. It is 4-1/2 inches wide and holds 12 ounces of culinary goodness. It is the perfect way to present an individual serving of delicious enjoyment and it comes in many beautiful colors. 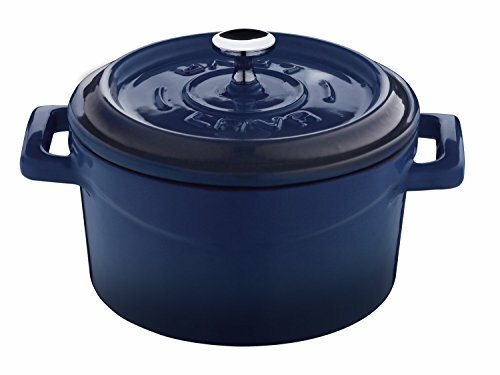 Lava makes Mini Dutch Ovens just like it makes large ones, with three layers of beautiful porcelain enamel outside and a special chef preferred, black matte finish inside. The enamels are bonded into premium cast iron that is fired twice for maximum beauty, durability and cooking performance. Only the best cookware in the world is made this way. Mini Dutch Ovens are the perfect solution for yummy personal sized entrées, interesting hot or cold appetizers or tempting desserts. Enameled cast iron cooks more evenly, predictably and deliciously than other small pots. It’s beautiful design and individual serving style offers delightful presentation options for many recipes. If you have any questions about this product by Lava Cookware, contact us by completing and submitting the form below. If you are looking for a specif part number, please include it with your message.